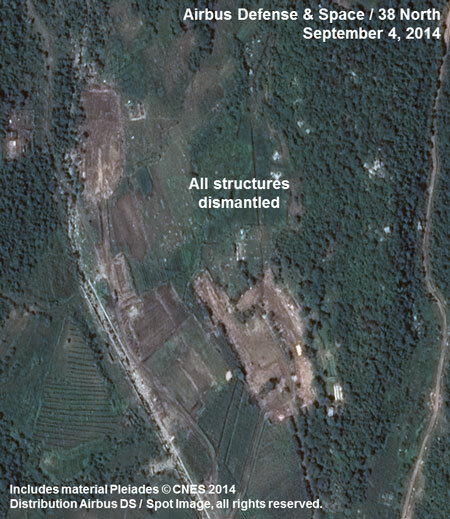 Recent commercial satellite imagery indicates that North Korea has completed a major construction program begun in late 2013 to upgrade the Sohae Satellite Launching Station. A key component of that program has been to upgrade an existing launch pad, enabling it to launch rockets larger than the existing Unha-3 space launch vehicle in the future. 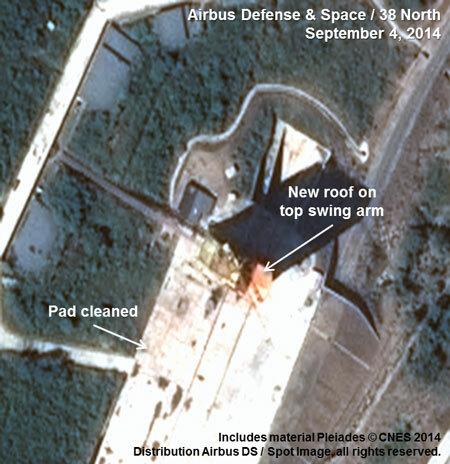 North Korea is now ready to move forward with another rocket launch. Should a decision be made soon to do so in Pyongyang—and we have no evidence that one has—a rocket could be launched by the end of 2014. The most likely candidate remains the Unha-3 SLV, last tested in December 2012, since a much larger rocket, reportedly under development, is at least several years from becoming operational. Continuing activities on the ground at Sohae merit close watching. Imagery from mid-September spotted tanks near the propellant storage buildings at the launch pad for the first time since the 2012 launch. The exact purpose of this activity remains unclear. 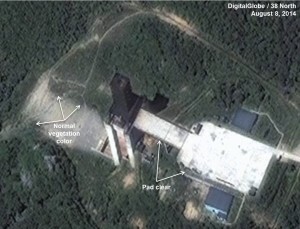 Recent imagery also indicates that Pyongyang conducted another engine test in early August of the rocket motor used in the KN-08 road-mobile intercontinental ballistic missile (ICBM), part of a series begun in early 2013. It remains unclear how successful these tests have been. However, rocket motor tests are typically conducted prior to full-scale test launches of a missile that precede a weapon becoming operational. 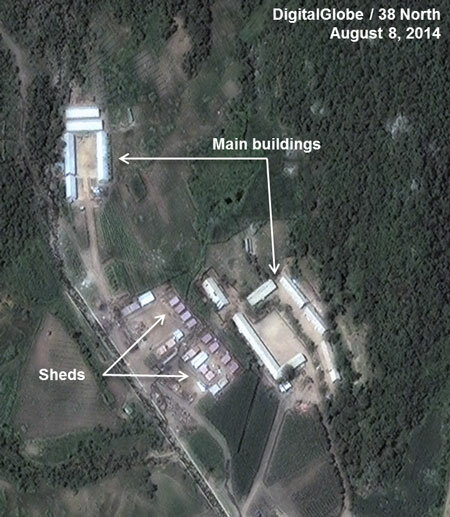 Recent commercial satellite imagery indicates that North Korea has completed a year-long program to upgrade the facilities at the Sohae Satellite Launching Station (Tongchang-ri). The garrison and support base for the main construction unit—built in summer 2013—was completely dismantled between August 11 and September 4, 2014. Beginning in August, 21 small shelters were removed. By September 4, 12 larger buildings had also been dismantled. Rail cars, probably used to transport the unit and its equipment to another site, are present at the rail siding. Ten freight cars were parked just north of the rail siding on August 8. Three days later, only five were present, and by September 4, none. Figure 1. Support area for the main construction unit has been dismantled. Note: images rotated. Image before © 2014 DigitalGlobe, Inc. All rights reserved. Image after includes material Pleiades © CNES 2014. Distribution Airbus DS / Spot Image, all rights reserved. For media licensing options, please contact [email protected]. A key part of the construction program was modifying the gantry tower and launch pad to handle space launch vehicles (SLVs) larger than the Unha-3 SLV. The gantry tower was raised to 55 meters by adding three new platforms to handle rockets up to 50 meters in height. The North is reported to be developing such a new rocket although information on its specifications remains sketchy. Nevertheless, work at the site seems to confirm that a new DPRK system will use the same fuel and oxidizer as the Unha SLV since there were neither modifications made to the existing propellant tanks nor additional plumbing added on the pad. In addition, swivel arms containing work platforms—installed at the gantry’s top and bottom that surround the rocket until just before launch when they are retracted—as well as new environmental covers to provide an improved ability to both hide and protect the rocket as it is being checked out on the pad. When viewed on September 13, painting of the tower was in progress with the new metal parts probably covered with a rust resistant primer and the machinery at the top painted yellow. The solid coverings for the swing arms on the east side of the tower have been removed and are being spray painted white on the pad near the gantry. Access to the pad was also improved with the construction of a new wider access road. A 120 m railroad tunnel was constructed alongside the pad that connects with the new 1.4 km rail spur coming from the rail siding, but the tunnel remains incomplete. Figure 2. New roof and swing arms installed on the gantry tower. Note: images rotated. Images include material Pleiades © CNES 2014. Distribution Airbus DS / Spot Image, all rights reserved. For media licensing options, please contact [email protected]. Figure 3. Fully modified gantry tower. With the completion of work, North Korea is now ready to move forward with another rocket launch should a decision be made in Pyongyang to do so. If such a decision were to be made soon, a rocket could be launched by the end of 2014. The most likely candidate is the Unha-3 SLV given that the larger rocket mentioned above is still in development. One possibility is that the tanks contain fuel and oxidizer and are being used to fill up buildings adjacent to the pad as a prelude to an upcoming launch. However, that seems unlikely at this point since there is no activity at other key Sohae facilities—the rail station, missile assembly building or instrumentation facility—consistent with launch preparations. 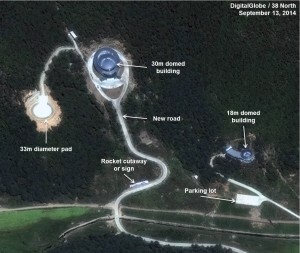 Another possibility is that the tanks offloaded an unknown liquid—perhaps water—in order to conduct post construction tests of the new gantry plumbing in order to insure that it works properly after the completion of eight months of work at the launch pad.This explanation is consistent with the lack of activity at other key Sohae facilities. Figure 4. 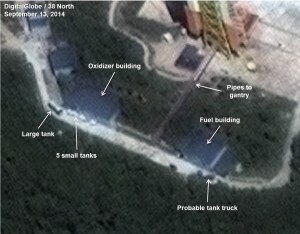 Tanks seen near the storage buildings at the Sohae launch pad. Permanent Instrumentation Site: New permanent telemetry and radar tracking buildings were built replacing dirt pads and temporary sheds used for mobile instrumentation equipment to support the 2012 Unha-3 launches. Larger Railroad Station: Two 45,000 gallon vehicle fuel storage tanks were added at the rail station, along with a pumping station and a 16-vehicle garage, indicating the likelihood of expanded activity expected onsite. Construction of Domed Buildings and a Nearby Concrete Pad: Two buildings, one with a45 m diameter and a 30 m dome and another smaller structure 18 m in diameter with a 10 m dome as well as a 33 m in diameter concrete pad were rapidly built this past summer as a high priority near the end of the construction program. The purpose of this complex still remains unclear although the larger building—seen during construction—appears to be a conference facility/auditorium. If this is the case, the smaller domed building may serve as an orientation center while the nearby concrete pad could be used for demonstrations, training or even as a helicopter landing area. 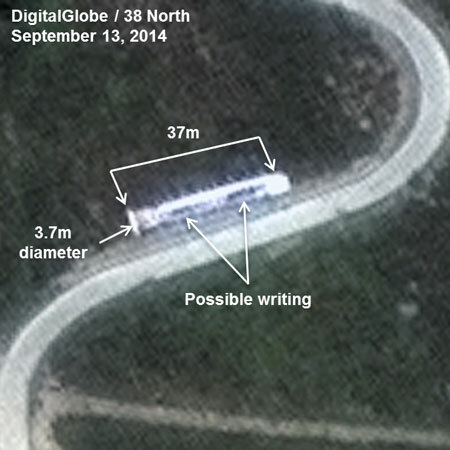 Moreover, imagery from early September indicated that the North Koreans had built an unidentified object—about 37 m long and possibly 3.7 m in diameter—along the road at the entrance to the complex—that may have writing or openings on its side. The object is possibly a large road sign in the shape of a rocket. 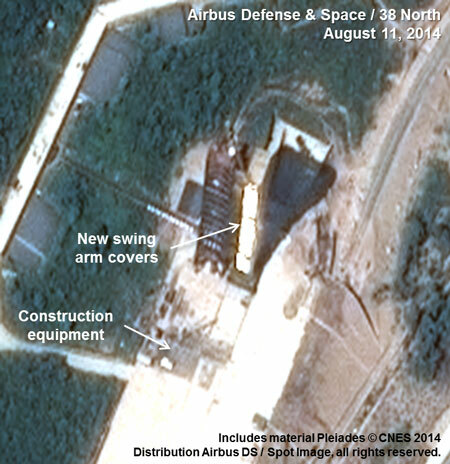 If that is the case, it may indicate that the new complex is associated with the DPRK’s new National Aerospace Development Administration (NADA) announced in April 2013. Extensive Infrastructure Improvements: The facility’s ability to handle increased activity as well as larger rockets and to conduct its overall mission more effectively was upgraded including: 1) a 1.4 km new railroad spur from the existing rail siding to the main launch pad; 2) 3 km of new and upgraded roads; 3) an underground communications and data cable network that links most major facilities; 4) a housing area north of the main gate consisting of 21 buildings; 5) flood repairs and other measures to prevent future damage in the aftermath of this summer’s heavy rains; 6) construction of several small buildings throughout the site; and 7) demolition of the motor pool facility and a building across the road from the rail station. Figure 5. Newly completed complex of buildings and pad. Figure 6. Possible entrance signage. Image before © 2014 DigitalGlobe, Inc. All rights reserved. Image after includes material Pleiades © CNES 2014. Distribution Airbus DS / Spot Image, all rights reserved. For media licensing options, please contact [email protected]. 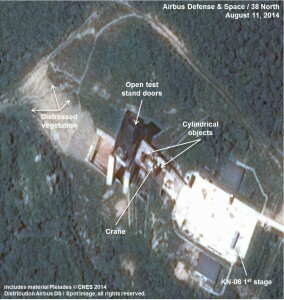 Imagery from August 11 indicates that North Korea probably conducted another test of the first stage motor for the KN-08 road-mobile intercontinental ballistic missile (ICBM). While there was no activity at the test stand or fuel or oxidizer tanks present on August 8, three days later a KN-08 first stage is visible on the test stand along with three other objects. Two cylindrical objects, a probable crane and several unidentified items are on the ramp to the test stand with fuel and oxidizer tanks just off to the sides. 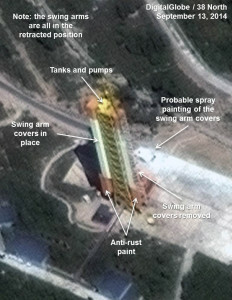 Two features indicating a test may have recently taken place are: 1) the doors in the front of the stand are open, the first time they have been seen open on available imagery. It is necessary to open these doors to place the engine inside and to remove it once the test is completed; and 2) the vegetation in front of the flame trench is distressed (burned). The cylindrical objects on the ramp may be the means by which the engines are secured inside the stand. By September 4, there is no activity at the stand with several of the vehicles related to the KN-08 engine test program—including prime movers probably used to carry the rocket stages—previously at the north end of the missile assembly building now parked at the southern end. Figure 7. No activity on the engine test stand in early August. Figure 8. Activity indicates an engine test was conducted. 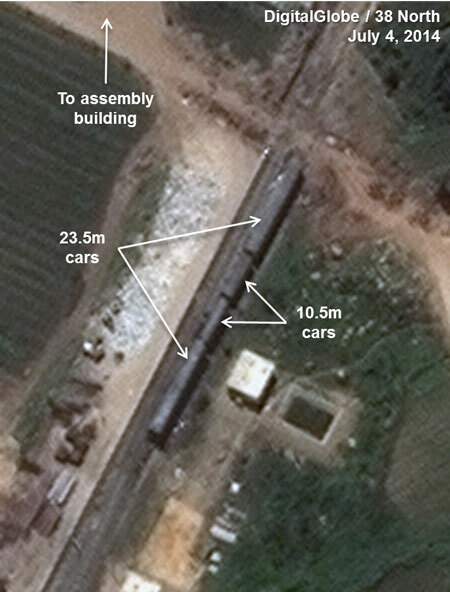 Consistent with general use in the DPRK, the cars may have unloaded material as part of the construction program or transported special equipment to go inside the new domed buildings. Seen at Sohae bringing in media prior to the April 2012 Unha launch, they may have transported DPRK VIPs to the site to inspect work as the construction program wound down. 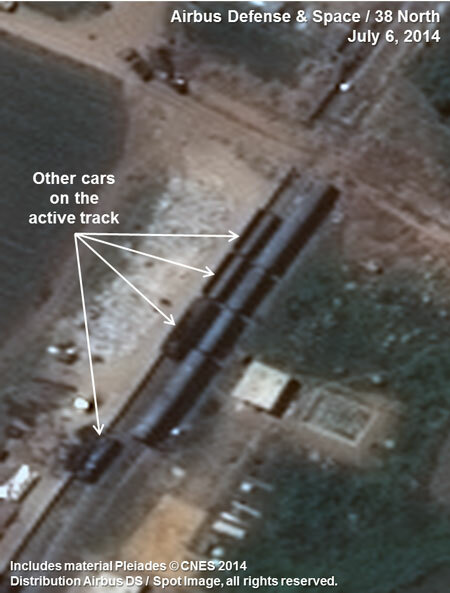 While of sufficient size to transport Unha SLV stages to the site for storage in the missile assembly building, there is no other evidence of such shipments, nor have vehicles associated with the rockets, such as the trailers used to transport the stages to the launch pad, been spotted. Figure 9. Unusually large rail cars spotted. It has been almost two years since North Korea launched the Unha-3 SLV intended to place a satellite in orbit. With the completion of construction activities at Sohae, particularly the modification of the gantry tower and launch pad, the North seems ready to resume activities at this site. If the political decision was made tomorrow—and of course no one knows whether it will or not—Pyongyang could conduct a new Unha launch by the end of the year. The first and second stages of the Unha-3 SLV—measuring 15.4 m long, 2.4 m in diameter and 9 m long, 1.5 m in diameter respectively—would fit inside the cars. 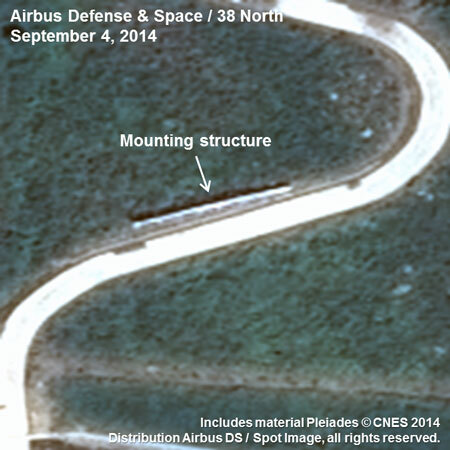 Also a fully assembled KN-08 ICBM—measuring 17 to 18 m in length—could also be carried by the longer rail car.